Many different wraps for food exist that are made out of paper. Butcher paper rolls are used in a variety of applications including meat butcher companies, delis, and even in warehouses for packaging. We are the restaurant supply leader for paper based food wraps from GP Dixie and Marcal including deli papers and bakery tissues. Freezer paper is also a very popular item for restaurants to use in storing meats and other foods in the freezer. 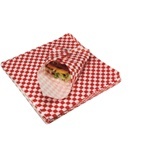 Buy your kitchen Paper Food Wrap from the restaurant supply experts. Our Paper Food Wraps come in many different sizes and types including freezer paper, meat paper, panliners, and butcher paper.